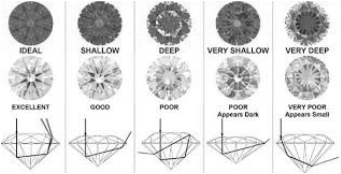 HOW DOES PAVILION DEPTH AFFECT A DIAMOND'S CUT?The distance from the bottom of the girdle to the culet is the pavilion depth. A pavilion depth that’s too shallow or too deep will allow light to escape through the sides or the bottom of the stone. A well-cut diamond will direct more light through the crown.